Absolutely Stunning! 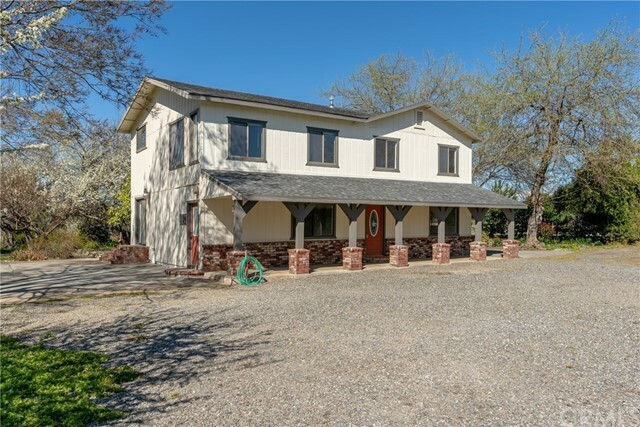 15 ACRE RANCH PROPERTY in the irrigation district & complete with LARGE BARN, DETACHED GARAGE and gorgeous views located just a short 20 minutes from Chico!! Just inside, you will find a spacious kitchen & dining room, with a lovely built-in hutch. Kitchen is all electric with beautiful oak cabinetry & plenty of room to add island. The living room is carpeted with a big bright dual pane window and sliding glass door. Relax and snuggle up next to the raised hearth fireplace on a chilly winter evening. Large family room is great for extra seating for large gatherings, or can be used as an extra bedroom! other Bedrooms are all upstairs, with the master having a large built-in vanity, and two walk-in closets! Enjoy the breathtaking springtime views from the comfort of your back patio or balcony. Plenty of room between you and neighboring houses, along with added privacy of large trees surrounding the house. There is a 2nd septic on the property for added possibilities!! Just imagine coming home after a long day, grabbing your favorite beverage and relaxing while watching the world go by! Barn has been well maintained and there is plenty of livestock fencing to suit whatever your need might be! Bring your 4-H projects, hobbies and toys, there is plenty of room for all! County record shows a 2 bed, Agent counts 3 bed with a possibility for a 4th. Lot size, sq ft, and year built all taken from county record, buyer to verify all information to satisfaction.